Here are the close ups of the box and album I made for the contest. Enjoy! There were four pages in the album. Sorry, I don't know the measurements for the album and the box. I didn't write it down when I made this. I might have to make a brand new one to figure that out. Hope you like it and if you have any questions you can ask away. This is a new challenge I'm participating in. The challenge is not new. It has been around for awhile. Once a month it will have a different color challenge. I thought I give it a try this time. Here are my cards. I made two because I can't decide which one I like better. I love them both. Thanks for stopping by! I hope it is okay to have two cards. Hi, stampers! It is raining here but I like the cool feeling from all those hot spells this summer. 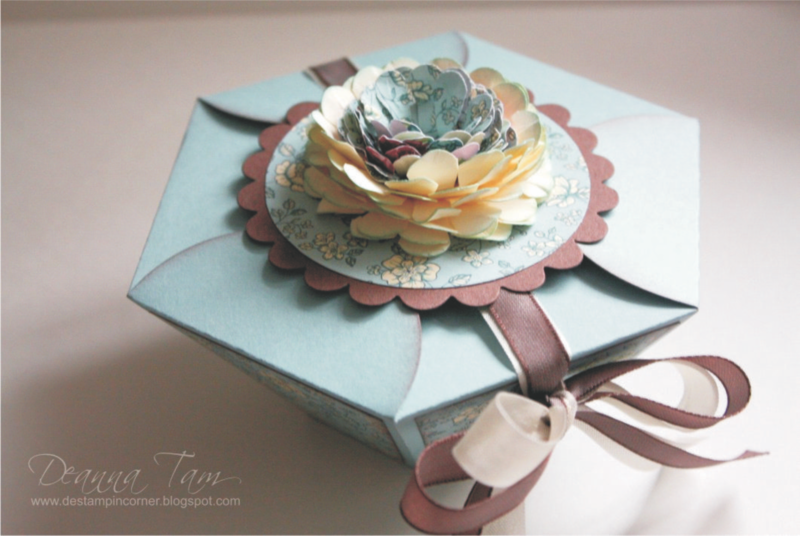 Today's card uses Blooming Beautiful stamp set that was in the past mini catalogue which made it in the Fall-Winter Idea Book and Catalogue. I use the new In Color Pacific Point and Pink Pirouette and the Bella Rose designer paper. I'm in love with these new In Colors. At first I was skeptical of the new In Color but they are so nice in real life. Especially the Pink Pirouette, it is lighter than Pretty in Pink. It is the right shade that I've always wanted. I colour the flower with markers and blender pen. SU doesn't sell makers in the In Color so I use blender pen to colour my picture. Here is a close up of the project. Ignore the ugly picture of me. Sorry about the quality of the photos. You can click on it for a larger view. I didn't make a second one to keep. :( But I did take pictures of the projects before sending it to SU. I'll post it in the next post. 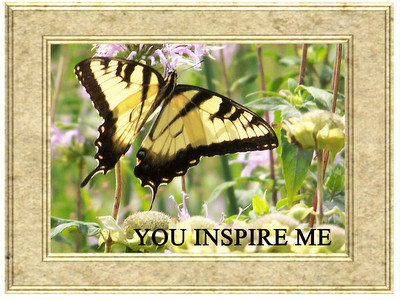 I got this beautiful award "You Inspire Me" from Debora. I feel so honor to have receive this award. Thanks, Deb! You inspire me too with your wonderful artwork creations. Here are some people who inspire me everyday. There are some I can't re-award so this what I got. Another giraffe baby card. Isn't he cute? I use the giraffe more than he bear from the Bundle of Joy stamp set (retired set). I never know what to do with the bear. The background paper is the Summer Picnic Designer Paper. The sentiment is from the In The Stars stamp set which is available to purchase from the Fall-Winter 2008 catalogue. Have you got your copy of the Fall-Winter catalogue yet? It is full of beautiful new stamps and accessories. Oh! I love all the new designer papers they have. It is a must have. I always need baby cards so this time I made a few early. This is one of them. I just love this giraffe. It is so cute. There will be a baby shower coming up soon. I might use this one or probably come up with a new one to match the can. Don't know yet. This was the left over card kit my customers made sometime ago. I'm trying to clean up my stamping room. So whip up this card using the Live Your Dream stamp set instead of Time Well Spent. If you are around the greater Vancouver area please drop by this Saturday for my Open House. Email me for directions if you plan to come. Have a nice day and thanks for dropping by! This is the last of the three scrapbook pages I did last week. I did this page and the page here for the scrapbooking class on Friday and Saturday. All the ladies enjoyed it. I made this page and the other one for the lady in the picture. She was too sick to attend the scrapbooking class. I hope she feel better soon. Here are three cards I made with the Dreams du Jour stamp set that is from the new Fall-Winter Idea Book and Catalogue. Isn't this set beautiful? I love it so much and the Bella Rose Designer Paper is just gorgeous. I used the new In Colour papers to make the two first cards. Hope you enjoy looking at these beautiful cards. I sure enjoyed making them. It is always nice to have new stamps and accessories. It is like a new toy. It is Martin's birthday today. He turns 35. We gave him a surprised party on Saturday. Boy, was he surprised. He had no idea at all. The hard part of this surprised party was trying to get him to the party. But we manage to pull it off. I couldn't have done it without some of my friends. They are such a blessing. I decorated the wall of some of Martin's pictures. I friend helped made the banner. Here is the other page that I did last. I still have one more to show you. I left it at church for the ladies to see as a sample for the craft class. Hope you enjoy looking at the scrapbook page. Come back often. I'll have some cards to show you using the new In Colour papers, new stamp set "Dreams du Jour" and the new Bella Rose Designer Papers. 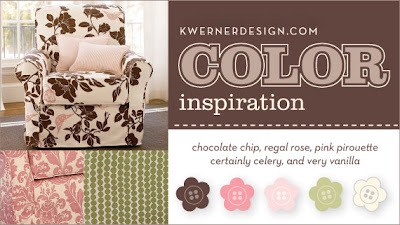 Over 200 pages of inspiration and ideas can be found in our latest Fall-Winter 2008 Idea Book & Catalogue. With full supply lists for every project, it’s so much more than just a catalogue! Backed by 20 years of quality, award-winning designs and innovation, I know you’re just going to love our product offering this fall. The stamp sets are just divine & there are 20 new fall inspired Designer Series Papers, 6 new yummy In Colors™ and 5 new punches that are at the top of every demonstrator’s wish list of must-have accessories. You’ve just got to see this collection! Come to my New Fall-Winter Catalogue Open House. You will receive a FREE copy of the Fall-Winter Catalogue. Email me at mrstam007@gmail.com for directions. Would you enjoy a 20% discount on all Stampin' Up! purchases? Would you like to get paid to stamp? Would you like to develop long-lasting friendships with other women that share your same love for stamping? Would you like to receive TONS of other benefits??? If you answered "yes!" 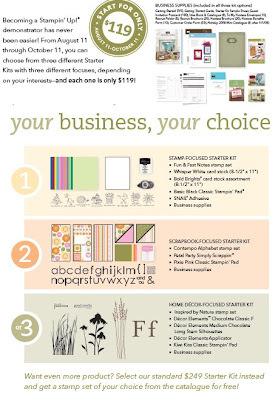 to ANY of these questions, then you should consider becoming a Stampin' Up! Demonstrator!!! There is room for EVERYONE at Stampin' Up!, and there are many levels of Demonstratorship! Discount Demonstrator: Likes the idea of buying stamps for personal use at a discount and may occasionally sell to family and friends, but doesn't hold workshops or classes. Hobby Demonstrator: Loves doing workshops and earning extra money when it's convenient, works a lot some months and very little other months; likes to do workshops that are easy to book; doesn't like to work too hard to book workshops. Enjoys her discount on stamping supplies. Career Demonstrator: Views Stampin' Up! demonstratorship as a viable business with long-term career potential; pursues management and wants to move up the career ladder, loves attending Stampin' Up! events and has developed close social relationships with other demonstrators; works at her business in a consistent and outgoing manner. Still loves the discount! 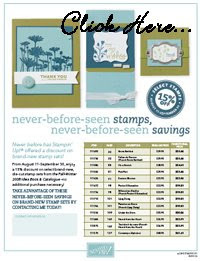 Join my team between August 11-October 11, and you will have the option of becoming a Stampin’ Up! demonstrator by purchasing one of three special mini Starter Kits* priced at $119. By joining, you will become part of my team, and I’ll provide you with all the help and support you need — but I will never push or pressure you to do more than you desire. Whether your goals are to just support your stamping habit, or you want to build a successful business, I am here to help. Email me at mrstam007@gmail.com and join my team. I’m so excited to announce that Stampin’ Up! has partnered with Sizzix to bring us the Sizzix Big Shot for Stampin’ Up! The Big Shot is a sturdy manual die cutting machine used to die cut materials for use on crafts, home décor projects, and even clothing– as you can see, it’s a big deal! You’ll love what the Big Shot machine, a 6-time winner of Creating Keepsakes Reader’s Choice Award for best die cutting equipment and dies, can do for you. The Big Shot will be available to order on September 2nd, so make sure to mark your calendar to order your Big Shot. 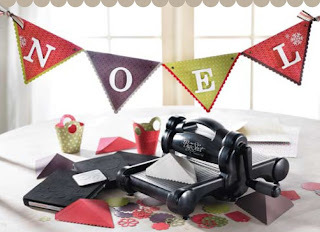 There will be select sizzix die cuts and exclusive die cuts available with the Big Shot. 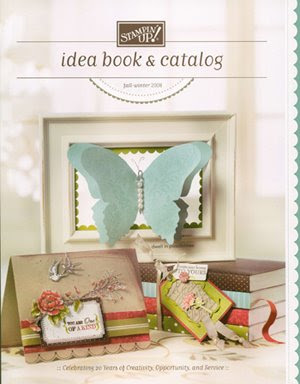 Stampin’ Up will also be coming out with even more fantastic die cuts in future publications. I have dies from other companies; can I use them with the Big Shot? Yes, you can. The Big Shot is the most versatile die-cutting machine on the market today. Using the multi-purpose platform, you can use dies, embossing plates, and other products from a wide variety of sources. What materials can I cut with the Big Shot? You can cut over 50 types of material using the Big Shot. A good rule of thumb is that if you can cut the material with your Craft & Rubber scissors, you can cut it with the Big Shot. Is the Big Shot exclusive to Stampin’ Up!? No, the Big Shot machine is not exclusive to Stampin’ Up! However, the Big Shot produced for Stampin’ Up! features a handle color as well as a beautiful logo that are not available on any other version of the Big Shot. In addition to the hundreds of dies already available through Sizzix, they’ve created dies exclusive to Stampin’ Up! And, as we continue to develop this product line, you’ll see more and more Stampin’ Up! exclusive dies. *Pre-order the Big Shot Special Edition Starter Kit ($232.95*) or the Special Edition Starter Kit with bag ($308.95*) by August 31st and receive: Level 1 hostess set (from the new catalogue), $20 in Stampin’ Up! merchandise of your choice, and a free Big Shot die. Email me at mrstam007@gmail.com to place your order today. Orders will be placed on Sept. 2nd and will take 7-10 days to arrive at your door. I made three scrapbook pages this week. Well, one still need embellishment but that is not bad. At least I got two done. I'm so proud of myself. I cased this layout from the Stampin' Success Magazine for demonstrator. I was only able to take a photo of one page so I'll show you the other's another day. Thanks for stopping by! I made this for a friend's 15th wedding anniversary. Hope the couple likes it. This is a 5"x8.5" and there are 15 pages. I've never been tag before so this will be fun. I was tagged by my upline Caroline. Here are 7 things about me. 1. I married my high school sweetheart. He's the one and only person I dated. 2. I'm not a morning person. I love to sleep. 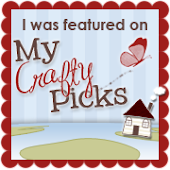 I used to sleep from 9 p.m. to 9 a.m. until I joined Stampin'Up! Now I only have 6 hours of sleep. 3. I took a course in fashion designing and never finished it. 4. I made my 4 sister's wedding dresses. My fifth sister still not marry yet. And of course I made mine too. 5. I worked at McDonald's after high school. I started out working at the grill and hated it. I prefer working at the till than at the grill. I got to a Swing Manager position and quit shortly after that. 6. My family (then I only have two children, Faith was only 5 months old) traveled by faith (we didn't have much money) across the USA to Ajax and Simco, Ontario and then back across Canada. That probably the first and last time we make a trip like that. 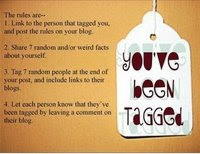 Here are 7 people I'm linking to. Here are some of our photos from our trip to Seaside, Oregon. Jarod,Faith and Gabriel buried in the sand. They really enjoyed it. The men and the children went crabbing. Before we left Seaside we took some beautiful family portrait on the beach. The children was in a big ditch and they did all kinds of funny things. They all cried out "water, I need water." Too cute! A group photo with friends. They went on vacation with us. It was a nice and relaxing vacation and everyone was sad to go home. Hope you enjoy looking at the photos. Hello, everyone! Hope you all have a great summer so far. Being away for a month was refreshing and relaxing. It took me awhile to get back to stamping but when I get started there is no stopping. Here are two boxes in a bag I made this morning. They are so easy and fun to make. They are great for putting all sorts of goodies inside. I'm not sure who came up with this idea but I love it. Don't forget you have until August 10th to order from the retired list. Here are the links to the retired lists.